Hi everyone. Welcome back to my blog. So I recently attended An Evening With Lancome, here in Lagos, Nigeria and it was really an awesome experience. 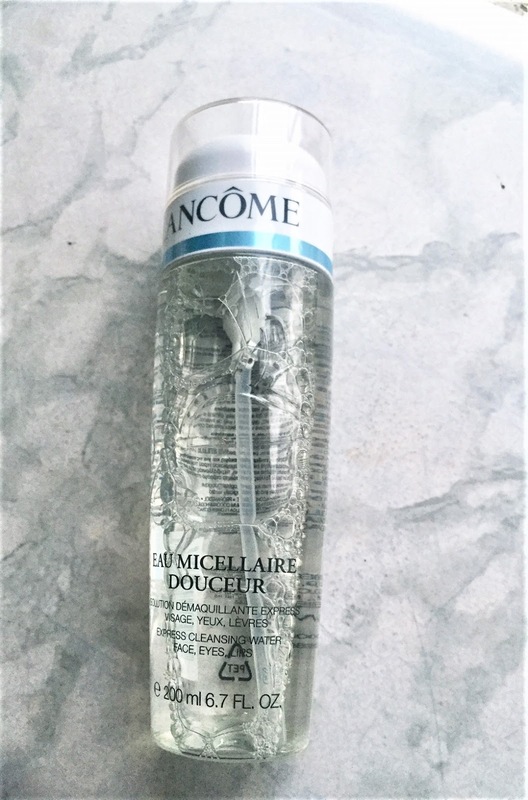 As part of our (super generous) goody bag, I got the Eau Micellaire Douceur (Express Cleansing Water for Face, Eyes and Lips). Basically, it's Lancome's version of the super popular micellar water formula. Micellar Water is basically tiny balls of cleansing oil molecules (also known as micelles), suspended in clean, soft water. The most popular brand of Micellar Water is Bioderma because it has been used by professional makeup artists backstage at fashion shows for years. I've used quite a few micellar water brands and honestly, only two were winners for me, so I was super excited to try this one out. I already love the Bi-Facil Eye makeup remover, so I had high hopes for this. I was not disappointed. I've called this post a First Impression and not a review because I've only used it twice, which, in my opinion is not enough to do a proper review. Anyways, let me get into what I liked about it. It has a pump. I love skincare (and makeup) products that have a pump. Most of the time, a pump means controlled product output and in turn, less waste. It doesn't have a strong scent. I does have a light scent and it goes away pretty quickly after application. It really gets all the dirt and makeup off, including eye makeup. I don't wear water proof mascara, so I can't tell if it's strong enough for that, but it takes off all the other eye makeup (including the Inglot no 77 eyeliner). It does not leave my skin feeling taught and dry when it dries. There's a significant amount of alcohol in it. It's the second ingredient. I have sensitive skin, but I have not broken out, so I'm hopeful (fingers crossed). It is a little expensive for a cleansing water. This and other Lancome products can be bought at The Beauty Bar Essenza at the Palms Mall in Lekki Phase One, Lagos Nigeria. You can also get it at all Lancome stands and stores worldwide. So those are my initial thoughts. Will drop back in with a full review after using it for a significant amount of time. Do you have this? What has been your experience with it? Please let me know below, I love hearing from you guys!!! !